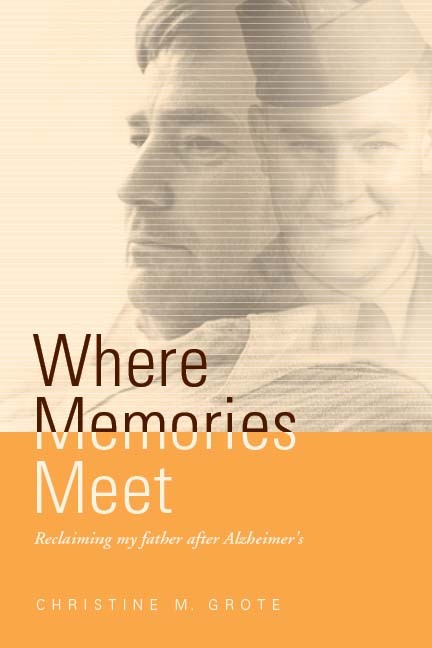 I’m excited to show you the cover for the soon to be published, Where Memories Meet – Reclaiming my father after Alzheimer’s. My daughter Anna designed the cover, as well as the interior of the book. Anna is an experienced graphic designer, having graduated from the University of Cincinnati School of Design, Art, Architecture, and Planning with a degree in Graphic Design. She worked several years for McGraw-Hill designing layouts for text books, and presently works for Humana in their Design Research Department. I’m very proud of her, and grateful for her talents and help on this project. I’m very pleased with Createspace for my publishing service. I sent them files early last week and had two print proof copies on my doorstep by Friday. I had to use a temporary cover because we hadn’t decided on a final design yet and I wanted to proof the text. Who knew there would be so many things to correct, even after all the editing and proof-reading? Hopefully tomorrow I will be able to order a second, corrected proof copy. And hopefully I’ll give myself the publishing green-light after I see it. Soon. This entry was posted in Books, Images, Where Memories Meet and tagged Self-publishing, Where Memories Meet on September 16, 2015 by CMSmith. I would be lost without Anna. Or else I’d have to pay someone else big bucks to do for me what she does. I love her work. I know what you mean and, in some ways, I could say the same. There was a lot about my parents that I didn’t really know, or think about much, until they were gone. It started at my mom’s funeral visitation when my aunt gave me some black and white photos of my mom being silly as a teenager. It works very well, Christine. Thanks, Patti. Thanks for sticking with me even though I’ve been a blogging slacker lately. I hope to be better at visting soon.